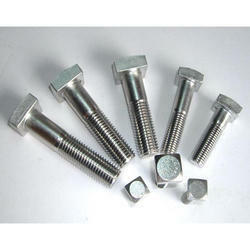 Offering you a complete choice of products which include carbon steel hexagonal head bolts, alloy steel hexagonal head bolts, stainless steel mushroom head square neck bolts, stainless steel hexagonal head bolts and nickel alloys hexagonal head bolts. If you are someone who appreciates only quality products, then NeelKamal steels Carbon Steel Hexagonal Head Bolts are exactly the one for you. We produce very efficient Carbon Steel Hexagonal Head Bolts that are manufactured to suit the needs of different industries. Carbon Steel Hexagonal Head Bolts If you are someone who appreciates only quality products, then NeelKamal steels Carbon Steel Hexagonal Head Bolts are exactly the one for you. We produce very efficient Carbon Steel Hexagonal Head Bolts that are manufactured to suit the needs of different industries. Carbon Steel Hexagonal Head Bolts are needed by many of the industries for fastening of different instruments.NeelKamal steels also produce customized Carbon Steel Hexagonal Head Bolts so that the clients get the perfect the size of the bolt that is need for the work. The eye bolts are of different varieties. Some of these are bent eye bolts and nut eye bolts. The bolts that are produced by us have a circular ring on the head.This is given for the suitability of attaching any rope or a chain at the end if needed. Carbon steel is used for the manufacture of the Carbon Steel Hexagonal Head Bolts to ensure that it is strong and hardy enough to do the fastening perfectly. If you are someone who appreciates only quality products, then NeelKamal steels Alloy Steel Hexagonal Head Bolts are exactly the one for you. We produce very efficient Alloy Steel Hexagonal Head Bolts that are manufactured to suit the needs of different industries. Alloy Steel Hexagonal Head Bolts If you are someone who appreciates only quality products, then NeelKamal steels Alloy Steel Hexagonal Head Bolts are exactly the one for you. We produce very efficient Alloy Steel Hexagonal Head Bolts that are manufactured to suit the needs of different industries. Alloy Steel Hexagonal Head Bolts are needed by many of the industries for fastening of different instruments.NeelKamal steels also produce customized Alloy Steel Hexagonal Head Bolts so that the clients get the perfect the size of the bolt that is need for the work. The eye bolts are of different varieties. Some of these are bent eye bolts and nut eye bolts. The bolts that are produced by us have a circular ring on the head.This is given for the suitability of attaching any rope or a chain at the end if needed. Carbon steel is used for the manufacture of the Alloy Steel Hexagonal Head Bolts to ensure that it is strong and hardy enough to do the fastening perfectly. 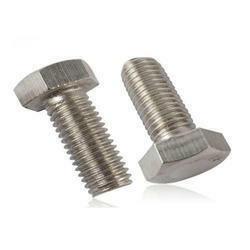 If you are someone who appreciates only quality products, then NeelKamal steels Stainless Steel Mushroom Head Square Neck Bolts are exactly the one for you. 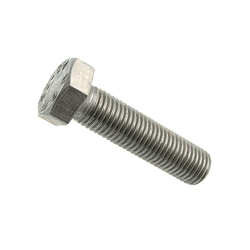 We produce very efficient Stainless Steel Mushroom Head Square Neck Bolts that are manufactured to suit the needs of different industries. 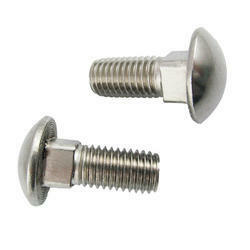 Stainless Steel Mushroom Head Square Neck Bolts If you are someone who appreciates only quality products, then NeelKamal steels Stainless Steel Mushroom Head Square Neck Bolts are exactly the one for you. We produce very efficient Stainless Steel Mushroom Head Square Neck Bolts that are manufactured to suit the needs of different industries. 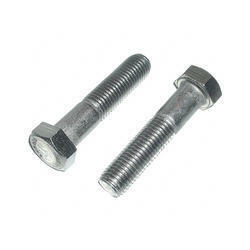 Stainless Steel Mushroom Head Square Neck Bolts are needed by many of the industries for fastening of different instruments.NeelKamal steels also produce customized Stainless Steel Mushroom Head Square Neck Bolts so that the clients get the perfect the size of the bolt that is need for the work. The eye bolts are of different varieties. Some of these are bent eye bolts and nut eye bolts. The bolts that are produced by us have a circular ring on the head.This is given for the suitability of attaching any rope or a chain at the end if needed. Carbon steel is used for the manufacture of the Stainless Steel Mushroom Head Square Neck Bolts to ensure that it is strong and hardy enough to do the fastening perfectly. If you are someone who appreciates only quality products, then NeelKamal steels Stainless Steel Hexagonal Head Bolts are exactly the one for you. We produce very efficient Stainless Steel Hexagonal Head Bolts that are manufactured to suit the needs of different industries. Stainless Steel Hexagonal Head Bolts If you are someone who appreciates only quality products, then NeelKamal steels Stainless Steel Hexagonal Head Bolts are exactly the one for you. We produce very efficient Stainless Steel Hexagonal Head Bolts that are manufactured to suit the needs of different industries. Stainless Steel Hexagonal Head Bolts are needed by many of the industries for fastening of different instruments.NeelKamal steels also produce customized Stainless Steel Hexagonal Head Bolts so that the clients get the perfect the size of the bolt that is need for the work. The eye bolts are of different varieties. Some of these are bent eye bolts and nut eye bolts. The bolts that are produced by us have a circular ring on the head.This is given for the suitability of attaching any rope or a chain at the end if needed. Carbon steel is used for the manufacture of the Stainless Steel Hexagonal Head Bolts to ensure that it is strong and hardy enough to do the fastening perfectly. If you are someone who appreciates only quality products, then NeelKamal steels Nickel Alloys Hexagonal Head Bolts are exactly the one for you. We produce very efficient Nickel Alloys Hexagonal Head Bolts that are manufactured to suit the needs of different industries. Nickel Alloys Hexagonal Head Bolts If you are someone who appreciates only quality products, then NeelKamal steels Nickel Alloys Hexagonal Head Bolts are exactly the one for you. We produce very efficient Nickel Alloys Hexagonal Head Bolts that are manufactured to suit the needs of different industries. Nickel Alloys Hexagonal Head Bolts are needed by many of the industries for fastening of different instruments.NeelKamal steels also produce customized Nickel Alloys Hexagonal Head Bolts so that the clients get the perfect the size of the bolt that is need for the work. The eye bolts are of different varieties. Some of these are bent eye bolts and nut eye bolts. The bolts that are produced by us have a circular ring on the head.This is given for the suitability of attaching any rope or a chain at the end if needed. Carbon steel is used for the manufacture of the Nickel Alloys Hexagonal Head Bolts to ensure that it is strong and hardy enough to do the fastening perfectly.